Measures nitrate levels on both fresh and saltwater aquariums. High levels of nitrate are a food source for unwanted algae and indicate poor water quality and health problems for fish. Tests nitrate levels from 0 to 160ppm. Nitrate (N03-) is produced in the aquarium by the biological filter. Beneficial bacteria in the biological filter convert toxic ammonia and nitrite into nitrate. A high nitrate level indicates a build-up of fish waste and organic compounds, resulting in poor water quality and contributing to the likelihood of fish disease. Maintaining a low nitrate level improves the health of fish and invertebrates. Excessive nitrate also provides a nitrogen source that can stimulate algal blooms. Aquarium water should be tested for nitrate once a week to make sure the nitrate does not reach an undesirable level. This test kit reads total nitrate (N03-) level in parts per million (ppm) which are equivalent to milligrams per liter (mg/L) from 0- 160 ppm. Fill a clean test tube with 5 ml of water to be tested (to the line on the tube). Add 10 drops from Nitrate Test Solution Bottle # 1, holding dropper bottle upside down in a completely vertical position to assure uniformity of drops added to the water sample. Cap the test tube and invert tube several times to mix solution. Do not hold finger over the open end of the tube, as this may affect test results. Vigorously shake the Nitrate Test Solution Bottle # 2 for at least 30 seconds. This step is extremely important to insure accuracy of test results. Now add 10 drops from Nitrate Test Solution Bottle #2, holding dropper bottle upside down in a completely vertical position to assure uniformity of drops to the water sample. Cap the test tube and shake vigorously for one minute. This step is extremely important to insure accuracy of test results. Wait 5 minutes for the color to develop. Read the test results by matching the color of the solution against those on the Nitrate Test Color Chart. The tube should be viewed against the white area beside the color chart. Color comparisons are best made in a well-lit area. The closest match indicates the ppm (mg/L) of nitrate in the water sample. Rinse the test tube with clean water after each use. In new aquariums the nitrate level will gradually climb as the biological filter becomes established. A nitrate level of 40 ppm (mg/L) or less is recommended for freshwater aquariums. In marine aquariums, it is best to keep nitrate as low as possible, specially when keeping invertebrates. Add API NITRA-ZORB™ to the filter to remove nitrate from freshwater aquariums. Making partial water changes can also help reduce nitrate, especially if the level is very high. However, because many tap water supplies contain nitrate, it can be difficult to lower nitrate levels by this method. API TAP WATER FILTER will remove all pollutants, including nitrate, from tap water, making water changes safe and effective. Toxic nitrite is produced by nitryfying bacteria in the biological filter as it breaks down ammonia. This kit tests for harmful nitrite and measures levels from 0 to 5.0 ppm. 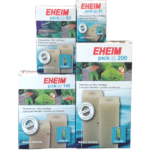 For freshwater and saltwater aquariums. Marina 100w Heater 100 watt submersible aquarium heater, for aquariums up to 100L.